eBird was launched in 2002 by the Cornell Lab of Ornithology and the National Audubon Society. eBird’s goal is to maximize the utility and accessibility of the vast numbers of bird observations made each year by recreational and professional bird watchers. It has amassed one of the largest and fastest growing biodiversity data resources in existence. For example, in March 2013, participants reported more than 33 million bird observations across North America! The observations of each participant join those of others in an international network of eBird users. eBird then makes these observations available to a global community of educators, land managers, ornithologists, and conservation biologists. In time, these data will become the foundation for a better understanding of bird distribution across the western hemisphere and beyond. Use the eBird button on the right to submit your sightings. Please note, you will need to create an account to do so. 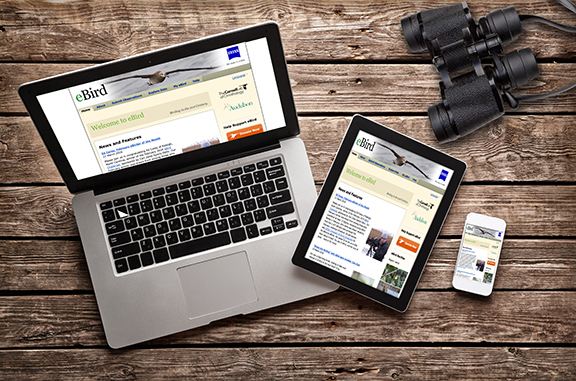 ​Once you have an account set up, you can submit your sightings or download the e-bird app on your smart phone.